The first Jews began arriving in Rome as far back as 160 BC, creating one of the oldest Jewish communities in Western Europe, and with over thirty-thousand Jews calling Italy home, it isn’t surprising that Hanukkah, the festival of lights, is celebrated just as passionately as Christmas. Hanukkah 2014 begins in the evening on Tuesday, December 16. Hanukkah celebrations last for eight days, with the dates being dictated by the Hebrew calendar. 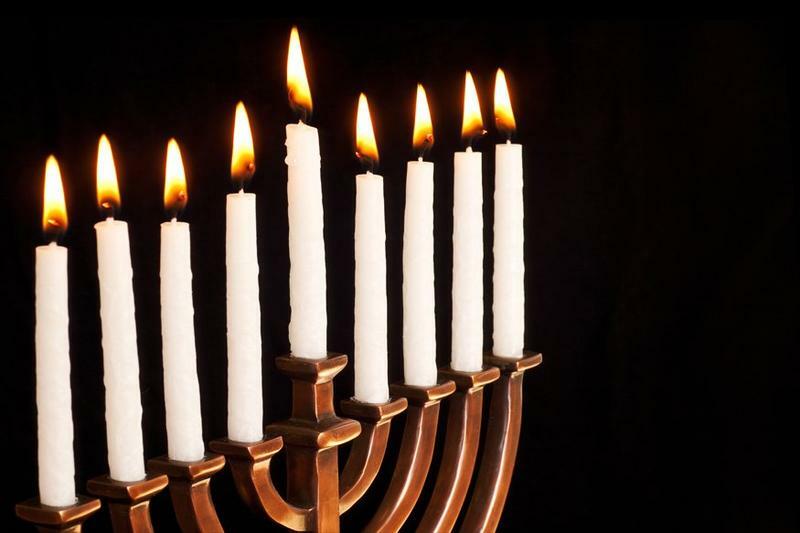 Each night a candle is lit on the nine-branched candle holder called the menorah until all eight candles are burning. The shamash; the ninth candle is raised above the eight others, its purpose being as a flame to light the religious candles below. On Rome’s via Sacra, near the Coliseum stands the Arch of Titus, built in AD81, shows a sculpture of a procession following the raid on the Temple of Solomon and, above the heads of the triumphant Romans, a menorah is held aloft. Today, a twenty-foot menorah is erected in Piazza Barberini and this becomes the central focus for Rome’s lighting ceremony. In Milan the large public menorah is traditionally set in Piazza San Carlo with the hope that its light will reach the hearts of the people. While in Venice, following the lighting of the menorah, the Cannaregio neighborhood is brought to life with music and dancing. Once the home of the world’s oldest Jewish ghetto, the five synagogues remain intact and are still used for worship by the local community. Florence’s past is also steeped in Jewish history with the Jewish museum on Via dei Giudei (street of the Jews) where the city’s ghetto once stood. Nearby is Tempio Maggiore, built between 1874 and 1882, and is the Synagogue of Florence where the city’s Jewish community gather to celebrate and light the Menorah before the feasting begins. The fried foods that are served during the holiday commemorate the miracle of the one day’s supply of olive oil that burned for eight days after the destruction of the temple. The Jewish communities celebrate with traditional recipes, such as, chicken marinated in olive oil, lemon and nutmeg before being dredged in flour and fried, thin slices of fried eggplant and potato pancakes. 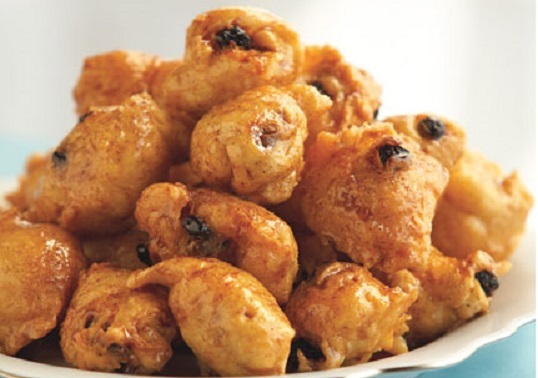 Frittelle di Chanukah (sweet fried dough fritters) are the traditional end to all Italian Hanukkah meals; balls of bread dough are stuffed with raisins and flavored with aniseed, fried and drizzled with hot honey. In the bowl of a standing mixer, dissolve yeast and 1 tablespoon sugar in 1 cup of lukewarm water. Using the paddle attachment, stir orange zest, juice and oil into yeast mixture, then add 2 eggs, 1 at a time, and remaining sugar and salt. Switch to the dough hook and gradually add 6 cups of flour, kneading for about 5 minutes and adding more flour as needed to make a slightly sticky, smooth and elastic dough. Grease a large bowl, turn dough into it and then turn the dough over to grease the top. Cover with greased plastic wrap and let rise in a warm place for 1 hour, or refrigerate for a few hours or overnight. When the dough has almost doubled, punch it down, remove it to a lightly floured counter, knead it briefly until smooth and divide it in half. Roll each piece into a cylinder about 27 inches long, making sure there are no seams in the dough. Bring one end of the dough up to the other and twist to form a spiral. Push both ends together to make a squat 12 ­inch loaf. Repeat with the other piece of dough and arrange loaves on a parchment ­lined baking sheet at least 2 inches apart. You can also twist the long spirals into a circle if you like; the dough is very malleable. Beat remaining egg and egg yolk and brush about half the mixture on the loaves, reserving the rest. Let the dough rise uncovered another half ­hour or overnight in the refrigerator. If dough was refrigerated, bring to room temperature. Heat oven to 350 degrees F and in a small bowl, combine fennel, poppy and sesame seeds. Brush the loaves with egg again and sprinkle with seeds. Bake for 35 to 40 minutes or until golden and firm when tapped with a spatula. Cool on a rack. 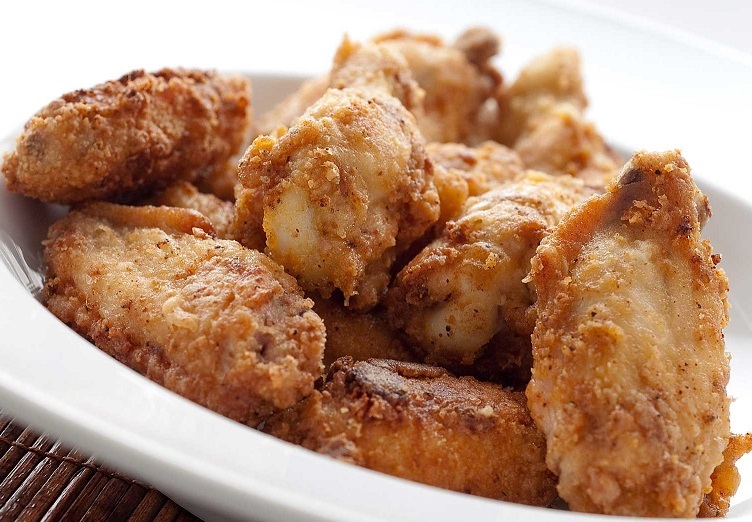 Place the chicken pieces in a bowl, seasoning them well with salt and pepper. Mix the 2 tablespoons of olive oil, nutmeg and the lemon juice in a measuring cup and beating the mixture well with a fork. Pour the mixture over the chicken pieces, turn them to coat on all sides and let them marinate for about an hour, turning them several times. When it comes time to cook, heat the oil in a pot. Remove the chicken pieces from the marinade and pat them dry. Beat the eggs in a bowl, seasoning them lightly with salt and pepper. Dredge the chicken pieces in the flour, then dip them in the egg and slip them into the oil. When they are well browned on all sides, remove them from the pot, drain them well, and serve them. Place the grated onion in a strainer set over a bowl while you prepare the other ingredients. Then wrap the onion in a dishtowel and squeeze out excess water. Place in a large bowl and add the squash, sage, baking powder, salt and pepper, oat bran and flour. Add the eggs and stir together. Begin heating a large heavy skillet over medium heat. Heat the oven to 300 degrees F. Line a sheet pan with parchment. Place a wire rack over another sheet pan. Take a 1/4 cup measuring cup and fill with 3 tablespoons of the mixture. Turn out onto the parchment-lined baking sheet. Repeat with the remaining latke mix. 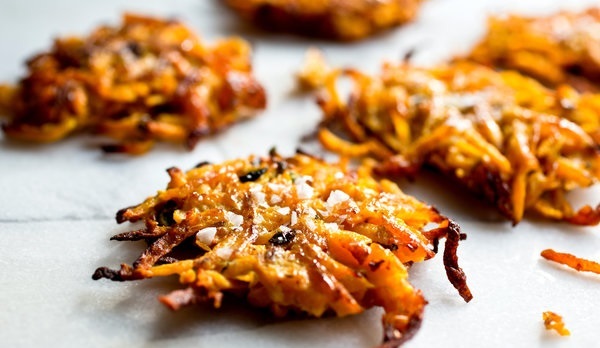 You should have enough to make about 30 latkes. Add the oil to the pan and when it is hot, use a spatula to transfer a ball of latke mixture to the pan. Press down with the spatula to flatten. Repeat with more mounds. Cook on one side until golden brown, 4 to 5 minutes. Slide the spatula underneath and turn the latkes over. Cook on the other side until golden brown, another 3 to 4 minutes. Transfer to the rack set over a baking sheet and place in the oven to keep warm. Serve hot topped with low-fat or regular sour cream. Melt margarine in a large pot over medium-low heat. Add onions; stir to coat. Cover pot and cook onions until very tender but not brown, stirring occasionally, about 35 minutes. Mix in ginger and turmeric. Add broth, olives, basil, mint and lemon juice. Bring to simmer. Mix in couscous. 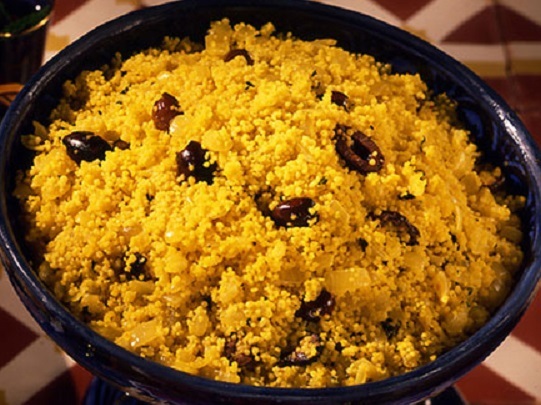 Cover pot, turn off heat and let stand until couscous is tender and all the liquid is absorbed, about 12 minutes. Fluff couscous with fork. Season to taste with salt and pepper. Pour couscous into a bowl and serve. Combine 1/4 cup warm water and sugar in small bowl. Sprinkle yeast over; stir to blend. Let stand until yeast dissolves and mixture is foamy, about 6 minutes. Whisk flour and salt in large bowl to blend. Make a well in the center. Add raisins, pine nuts, egg and 1 tablespoon oil to well. Pour remaining 1 1/4 cups warm water over, then pour yeast mixture over. Stir until a smooth dough forms. Scrape down the sides of the bowl; cover bowl with plastic, then a towel. Let dough rise in a warm draft-free area until doubled in volume, about 1 1/2 hours. Line a large rimmed baking sheet with a double layer of paper towels. Pour enough oil into large deep saucepan to reach a depth of 2 inches. Attach a deep-fry thermometer to the side of the pan and heat oil to 360°F to 370°F. Working in batches of 5 or 6 doughnuts, dip a metal tablespoon into the hot oil to coat and, without deflating dough, gently scoop up a rounded tablespoonful. Drop dough into the oil. Fry until deep golden, turning occasionally, about 5 minutes. Using a slotted spoon, transfer doughnuts to prepared sheet and drain. DO AHEAD Doughnuts can be made 6 hours ahead. Let stand at room temperature. Rewarm on the same sheet in a 350°F oven about 15 minutes. Whisk honey, 3/4 cup water and cinnamon in a heavy medium saucepan over medium-high heat until syrup comes to boil. Remove pan from the heat. Dip warm doughnuts into honey syrup and pile onto a serving platter. Pour remaining syrup into bowl. Serve doughnuts with remaining syrup. The pollo fritto look delicious! Thanks Annie – it is delicious and very traditional. So many great recipes in this round-up! Thank you for all your great recipes this past year Jovina! You’re an inspiration to us all! Thanks so much Karen and I love your videos. Have a wonderful holiday. OMG these foods. I love that there is still a strong tradition in Italy. Chanukah is so festive. Thanks so much for this post Jovina. 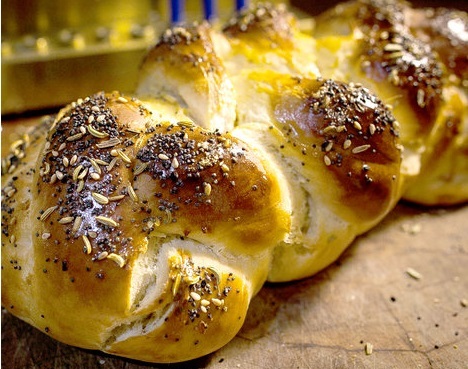 There are a number of cities in Italy that still have a large Jewish community and since they have been there for centuries the influence on Italian cuisine has been extensive. Thank you for your gracious comment. My grandmother on my fathers side was Jewish, as a child. When she left home and got married (to a French man) she became a Christian. I love fennel Jovina, wonderful flavor. This has nothing to do with food, but just the other day I went to the Natural Foods Market, to their Vitamin Cottage and bought some fluoride free tooth-paste with Tea Tree Oil and Fennel Oil. Yes I like the taste of fennel. I use Tom’s floride free brand of toothpaste with fennel. My wife uses Tom’s as well, but with peppermint.